August 2012 – I "SAM" THE TRUTH! Tell them I was happy that I attended. Thank you, Lord, I came, safely. With Sir Cortez, our department adviser. I cannot count how many laughs we had because of that somewhat funny incident. Plus, the fried chicken was wasted! Here are the two birthday celebrants of August 25, 1994: Me and Ariane Mae. We never forget to take a picture in every acquaintance party because it’s a custom of having our birthday, a few days after the party. Hey, hey, hey. The three of you? Illuminati? Clap your hands in the air and groove with the MUSIC. (From left to right) Pisces + Virgo = Michelle and Ariane! I meant that, no joke. The two Psych majors: Ate Ann and Ate Reg. Thanks for my co-Liberal Arts students who faced the camera and smiled, widely. The melancholic shot of me. Ariane Mae gave this shot a more detail to the background. Just before the Twilight welcomed the dusky evening, I got up on the wrong side of the bed. It was the 17th of August, 2012 – our university’s Acquaintance Party and Mass Induction of Officers. Honest as the day was long, I was having second thoughts whether or not to attend the party that night because I felt too weak and I wanted to lay down in bed and sleep. I didn’t feel sorry for attending the party because the pictures above tell the story. Thank you for waiting for the photos. Have a great day! Do you know someone? Someone who is so imperfect but he can make my heart melt with his undying love? An undying love, he is going to love me more than forever? Forever is not enough, he is spending almost every second of his life to prove my worth? He is imperfect but I define perfection as someone who is imperfect. He is average looking but I see him as the most brawn man. He is weak but I believe he is the strongest man who can save me from anything. In short, I see him differently from that of all people. I see beyond imperfection. There’s a friend whom I talked to before. We were waiting in the library, then. “You don’t necessarily need to understand something for you to like it.” He asserted. From that moment, I suddenly grasped that idea from him. There are times it takes more than our senses to perceive something or someone. If you know what a MAGIC is, then that’s what I am talking about. Do you know someone? Someone who is so imperfect but he can be my Beast for life? An imperfect Beast who loves me like Belle and doesn’t look for any other girl? Looking at me is his favorite pastime? When I say, he doesn’t look for any other girl, I mean nobody else aside from me. My imperfect man has all his eyes on me, and nobody else. Nobody else can catch his attention because we are like magnets: positive and negative electric charges do attract. And attraction involves only two people. Beyond the bounds of possibility, I still am looking for my imperfect man. It took me a thousand downfalls before I realized what I need, and not what I want. I need a man who loves me, unconditionally. A man who can’t like another girl because I am his only crush. It’s a bit thick that I don’t need someone who is perfect. I don’t need a gorgeous man who has a million girls in his eyes. It’s beyond contempt but I hate polygamous men. Pardon me, people. I wrote this post not to change your views or something. Neither nor, I didn’t bark a slogan for your definition of a PERFECT MAN. I am just looking for someone who is imperfect. 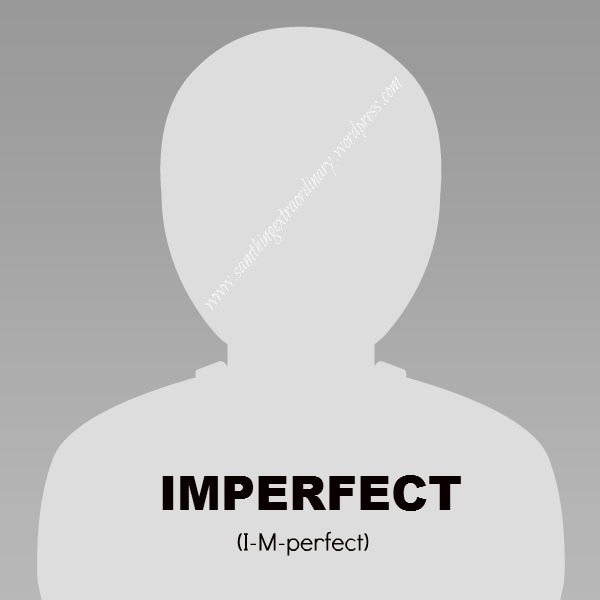 Someone who can say, “I-M-perfect!” Do you know one, please? 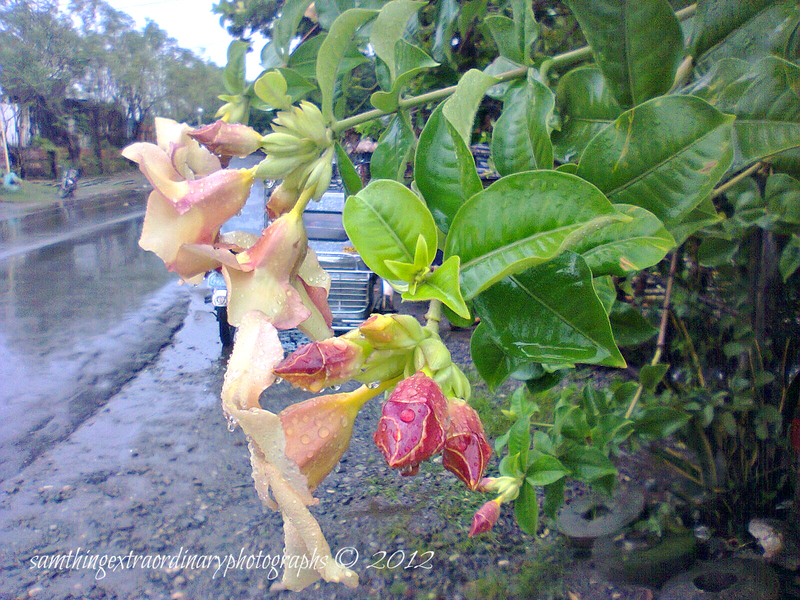 “Somewhere in Binmaley.” Luscious green leaves, russet brown branches plus the delicate yellow flower made the rain worthwhile. Strikingly beautiful. This photograph is a combination of earthiness and allure, that it focuses on the focal part of the three flowers. 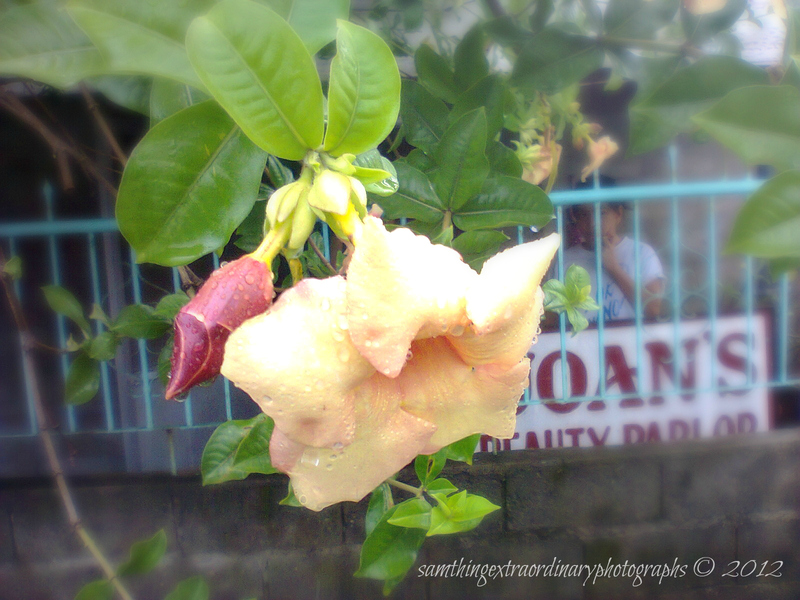 I also love how the leaves showed its restful harmony in nature. 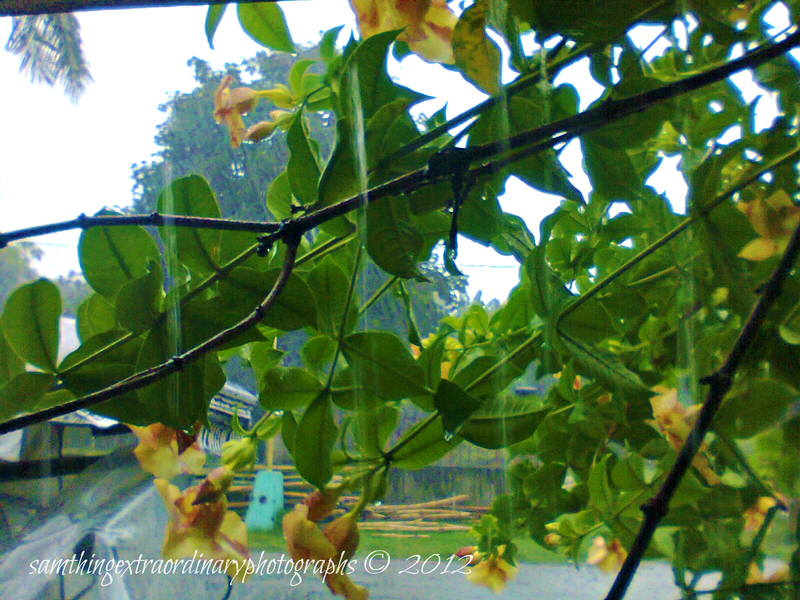 One of my purposes in taking this angle is to splash an eye-view of the pouring rain. 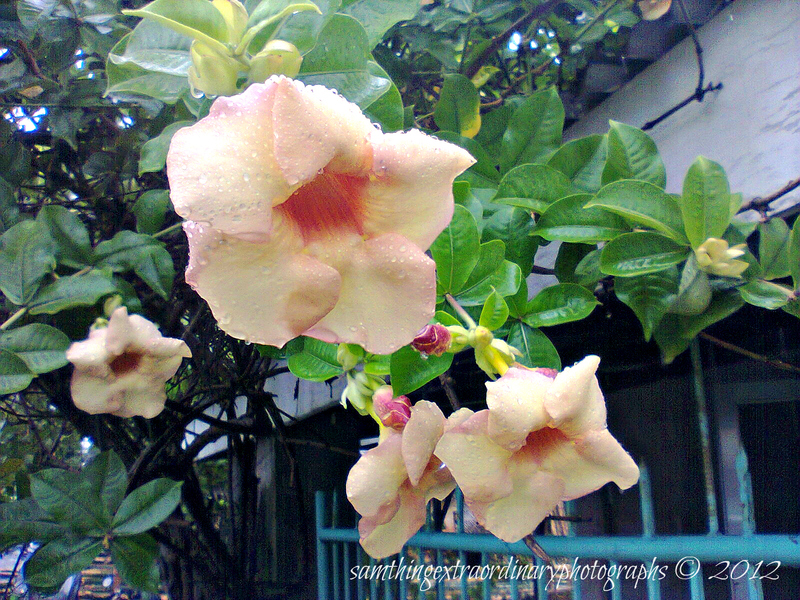 “Dad’s suggestion.” For me to give you a whole view of my subject, he asked me to take this, right after the rain poured. 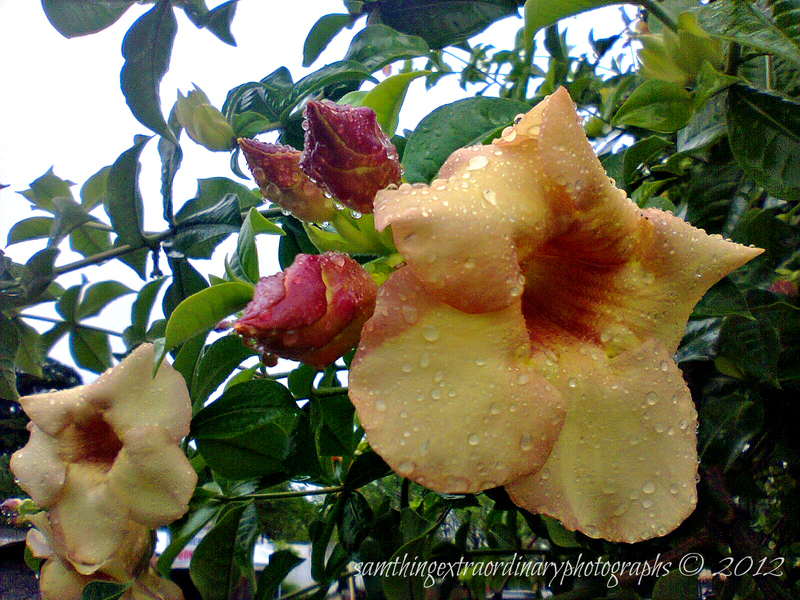 “The Flower and the Flower Buds.” When you spell daunting, flowers give us the first look that God created something pleasing to the eyes and to the soul. “A Discreet Beauty.” The single side view has a deep contour about nature’s universal love. “The uniqueness of a thing depends on the plurality of the mind.” If I roam around the bush, I sure know there are abundant things out there. But this flower’s beauty is exceptional. “If all the raindrops would taste like mint…oh, what a rain that would be!” Last month started raining so hard.I was with my pops back, then, and we were bounded to go home. The rain madly fell in a cloudy afternoon so we had no choice but to stop by at a near beauty parlor shop. 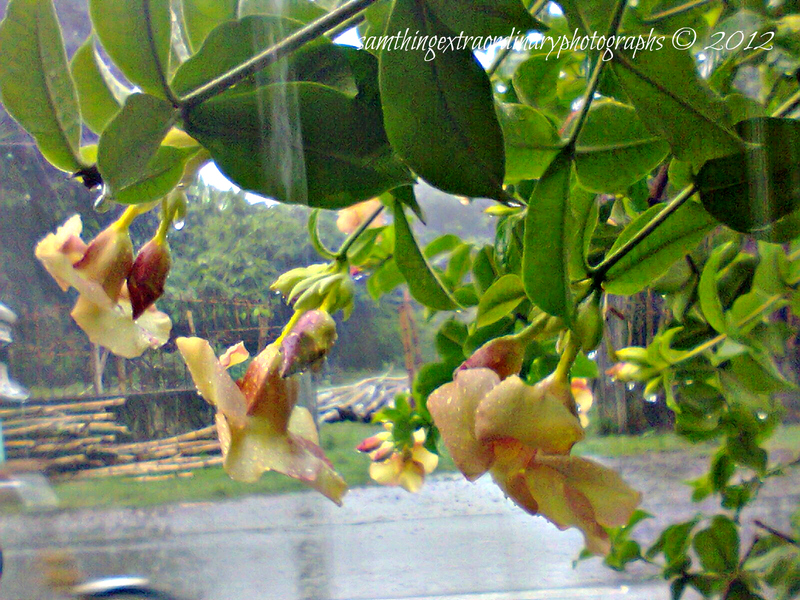 Raindrops add refinement to flowers. 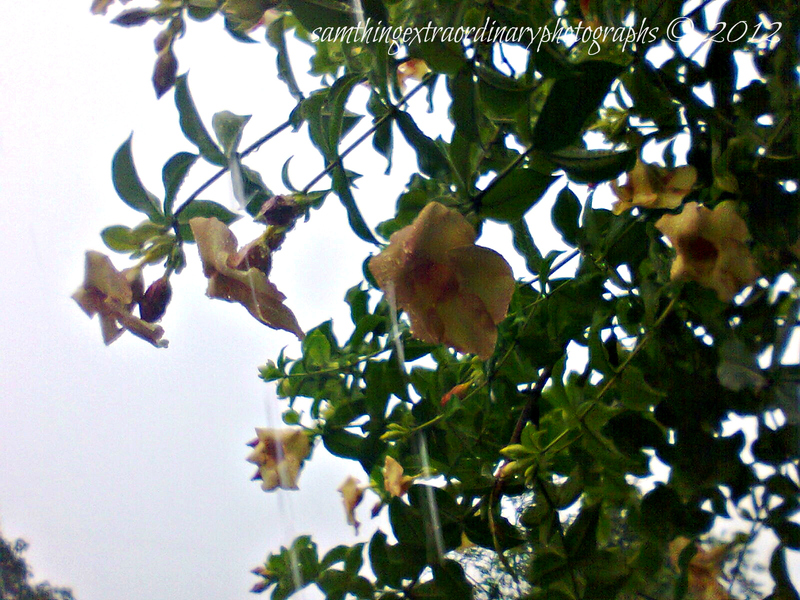 They complement the drippy leer of these flowers. Aren’t they beautiful?